Your air filter might seem like only a small component of your home comfort system. However, looks can be deceiving. That filter stands between the intake air and your HVAC system, so a clogged filter prevents air from circulating through the ventilation system. In other words, there won’t be enough air coming through to stay comfortable. 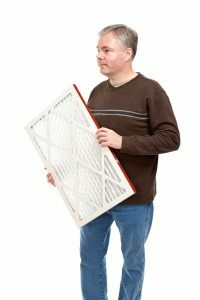 When you have hot or cold spots around the home, or when the temperature never seems to quite match up with the thermostat, you may have a clogged air filter to blame. And your physical discomfort is just the beginning. Your cooling system functions by absorbing heat from the air in your home. As refrigerant evaporates in the indoor evaporator coil, it’s able to absorb heat from air blowing over the coil. However, when the air filter is too clogged up, warm air is limited, which can cause the coil to freeze. As that frozen coil thaws, water can leak into your home, causing property damage. A frozen coil is never a good sign, and may be due to other problems that have nothing to do with your air filter. Therefore, if you notice it, be sure to give our team a call. You should never try to thaw the coil on your own as you may cause more damage, and you won’t resolve the root of the problem. Your blower fan will work much harder to try to bring in the right amount of air when a clogged filter blocks airflow. Changing your air filter regularly is one of the simplest ways to lower your monthly utilities. The point of all of this is to say that your home comfort system is designed to take in a certain amount of air each time it cycles. When that airflow suffers, the components of that system have to work that much harder to do their jobs. This means you can expect excessive wear and tear over the years, and your air conditioner is more likely to fail you when you need it the most. For quality West Palm Beach, FL HVAC services, look no further than Envirotech Air Quality Services. Contact us today!